My back is 100% better, and it only took two doses of Aleve, one dose of my prescription anti-inflammatory, and a day of rest. (Well, as much rest as I can muster in this family.) And of course, your well-wishes helped! Which leads me today’s final post for the A to Z Challenge: Z is for Zoltar. If you’re a child of the ‘80s, you’ve most likely seen the movie Big. Even if you aren’t a child of the ‘80s, you’ve probably seen this, since it’s one of the most iconic movies of its time. The movie is about young Josh Baskin (David Moscow), who makes a wish on a fortune-telling machine at a carnival to be Big. This results in him waking up as his thirty-year-old self (played by Tom Hanks). The rest of the movie deals with the consequences—good and bad—of getting what you wished for. The name of the fortune-telling machine? Zoltar. You can even buy your own Zoltar fortune-telling machine if you’re so inclined (and you have the money to burn). If I had my own Zoltar, I don’t know what I would wish for. Of course, there is the usual: world peace, no more poverty or hunger, better sitcoms and the end of reality tv. But what else? Always have enough money for the things we need. I don’t need to be a multi-millionaire. But I would like to have enough money to pay for our living expenses, for our kids’ education, for vacations, and for charitable contributions, and for any emergency that inevitably comes up. It would be nice to go out somewhere and open my wallet and have exactly enough to cover a restaurant check or new shoes. The magic to clean up messes with the snap of my fingers, a lá Samantha from Bewitched. Housework is the bane of my existence. The freshest, most delicious ingredients delivered to my door just when I need them. I love to cook and use fresh ingredients. But with four kids, it’s not an easy task to hit the market every day for fresh food; I have to buy my supplies ahead of time. Often, something will spoil before I get a chance to use it, or I won’t have any more of something on-hand when I’m ready to try a new recipe. It would be nice to have these things just show up when I need it. The cure for whatever ails us. I’m tired of losing people I love to cancer and heart disease and other ailments. When it’s our time to pass, I want it to be natural and pain-free. I’m tired of seeing good people suffer. Less traffic. It takes my husband 90 minutes to commute one-way to work. Evening rush-hour traffic often adds anywhere from 30 to 60 minutes to that. We hardly see each other during the week (and one weekend a month) and he almost never makes it home in time to see the kids practice their sports or instruments. More common sense, compassion, and compromise in our government. I’ve really been disgusted with the state of our current political system and how our politicians and political candidates conduct themselves. Nothing seems to get done. It’s like sending my sons to work together to clean their room—all I hear is blame and finger-pointing (“I didn’t make this mess!” “He’s not helping me!”). Do I need to go down and referee Congress like I do for my boys? Like I tell my boys, if I need to come down there, you ain’t gonna like it! More time. This one is in my control now, I just need to gain better time management skills. So maybe my wish should be to have more patience and dilligence, in order to use my time more wisely. What would you wish for? If you could have anything in the world, what would it be? Something tangible—a car, a trip? Something magnanimous—end to war, cure for cancer? Something private—another’s love, to mend a broken relationship? Share it with us below! I promised that today’s post would be twice a good, since Saturday’s was so lame (pun intended). 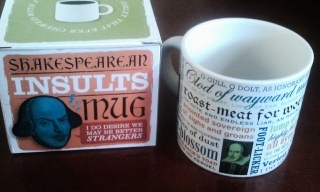 In honor of this being the final day of the A to Z Challenge, we are giving away this nifty little Shakespearean Insults Mug to one random commenter. Leave a comment on this post between now and 11:59 p.m. on May 1, 2012, and we will choose one lucky winner using Random.org. (Make sure you’ve left an email address so we can contact you for your address!) This is just a little thank you for stopping by and we hope you’ll visit again, even after the challenge is over! « Y is for YEEEOWCH! How I remember those Machines. Wow, I haven’t seen one for more than forty years now, reminds me of when I was a child. Hmm! Big, a good movie with some surprising but interesting turns, glad I didn’t get a wish like that answered. Blessings from sunny South Africa, Geoff. Loved your blog. 🙂 What do I wish for… well, money of course, and a PA who will clean, do laundry so I can enjoy more play time. Overall, I wish for cures for all the diseases and cancer and for peace in everyone’s heart. Thank you all for your comments and for visiting us! Hopefully we’ll be able to keep up the pace 🙂 See today’s post for the winner of our little giveaway! I’ve really enjoyed getting to *meet* and *know* so many of you on the challenge!